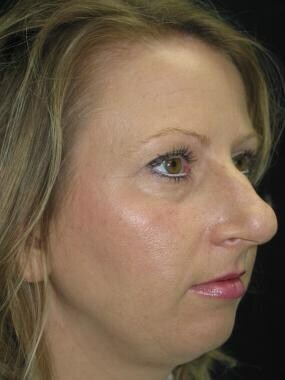 Surgically manipulating the nasal tip to achieve predictable results is the most difficult feature of rhinoplasty. 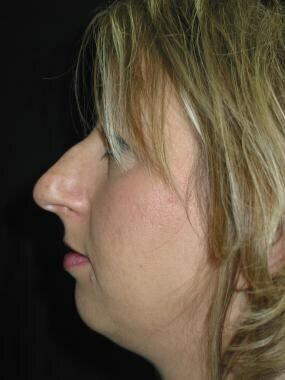 One who can control the nasal tip is said to be able to master rhinoplasty. Anderson first proposed the rhinoplasty tripod theory. A complete comprehension of the tripod theory and the dynamics of tip projection, support, and rotation allow categorization of the different factors that may need alteration to manipulate the nasal tip. Rhinoplasty is technically demanding, and tip surgery is an art form. It requires an in-depth knowledge of the complex three-dimensional anatomy of the nose, a complete understanding of its physiology, familiarity with the described techniques of nasal tip surgery, and a well-developed sense of aesthetics; all are essential in mastering rhinoplasty. Examples are shown in the images below. Inadequate support for nasal tripod before surgery. 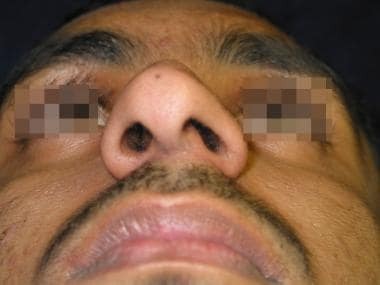 Crooked nose with bulbous tip after multiple trauma. After surgery with septoplasty, osteotomies, spreader grafts, lower lateral cartilage contouring, columellar strut, tip sutures, and grafting. For information, including news and CME activities, on many areas of aesthetic medicine, visit Medscape’s Aesthetic Medicine Resource Center. Click here to complete a Medscape CME activity on facial contouring and volumization. The nasal tip, a prominent feature of the nose, extends longitudinally from the supratip to the columella breakpoint and transversely between the dome-defining points. The nasal lobule contains the nasal tip and extends longitudinally from the lateral crural junction with the upper lateral cartilages to the columella breakpoint and transversely between the alar-lobule junction. The alar cartilages have been subdivided anatomically into the medial, middle, and lateral crura. The lateral crura determine the volume, size, and position of the nasal lobules. The conjoined medial crura form a pillar on which the nasal tip rests and is the primary component of the columella. The critical factor in tip support is the intrinsic structure and rigidity of the alar cartilages. The extrinsic support mechanism becomes important as alar cartilages are weakened surgically. Five fibrous connections are known to be important in maintaining the nasal tip shape: fibrous tissues between the upper lateral and lower lateral cartilages; the lateral border of the lower lateral cartilages at the pyriform aperture; the interdomal ligament and anterior septal angle; the footplate of the medial crus and septal cartilage; and the dermocartilaginous ligament. The fibrous attachments of the upper and lower lateral cartilages and the strong fibrous band that extends around the lateral crura and accessory cartilages constitute critically important supporting structures. The junction of the upper lateral and lower lateral cartilages is encased in a longitudinal fibrous sheath that splits into an anterior and posterior perichondral lamellae. This strong fibrous band extends around the lateral crura and accessory cartilages. The alar cartilages are held together medially by a transverse fibrous system; its central component is the interdomal sling. The first accessory cartilage is below the alar crease. The second is attached to the piriform aperture by the deep alar nasal muscle arising from the undersurface of the maxilla. The third accessory cartilage has a distinct fibrinous connection to the nasal spine and forms the internal nostril crease on the floor of the nasal vestibule. The apposition of bilateral narial arches forms a strong central beam for the nasal tip. It is important to note the relationship of the domes to the caudal septum and realize that a weak triangle is most frequently a surgically produced phenomenon. In a normal nose, the medial borders of the alar cartilages abut each other and cover the septal angle. Despite many anatomic drawings that show a ligamentous attachment between the footplates of the medial crura and the caudal septum, it is evident that this junction is more appositional than ligamentous; however, it is a major buttress for the nasal tip and a crucial contributor to columella contour. The dermocartilaginous ligament described by Pitanguy may influence tip-dorsum relationships. This ligament is most important in patients with a bulbous tip and in the noses of black patients, where the convexity of the lower third of the nose remains apparent after classic modification of the osseocartilaginous structures. Dividing and partially resecting this dermocartilaginous ligament allows the lower third of the nose and the nasal tip to move upward. Excision of the cephalic rim of the alar cartilage destroys the superior support, while resection of the caudal septum eliminates central support and an alar resection paralleling the nostril rim disrupts the cartilaginous ring. Preservation of tip support requires respect of the lateral crura accessory cartilage ring and judicious resection of the caudal septum, especially at the medial crura septum junction. In classic endonasal approaches, the caudal portion of the alar cartilages remains intimately attached to the skin sleeve while the abutting structures are modified. The tripod concept of tip projection, support, and rotation described by Anderson provides an understanding of the dynamics of tip rhinoplasty. The anatomy of the two alar cartilages forms a functional tripod that provides tip support. The right and left lateral crura comprise two legs of the tripod, and two conjoined medial crura function as the third leg. Anatomically, the medial crura are shorter than the lateral crura. The medial crural foundation is supported by the attachments to the superior and inferior septum. Incisions between the upper and lower lateral cartilages (ie, intercartilaginous incisions) and removal of the cephalic border of the lateral crura disrupts the interlocking relationship of the upper and lower lateral cartilages. The length, strength, and shape of each lateral crura produces a torque that pushes the lobular tip of the nose toward the upper lip and away from the peripheral aperture. An analysis of primary rhinoplasty demonstrates a postoperative decrease in nasal tip projection unless steps are taken to increase the length and strength of the medial crural segment. Either the cartilage-delivery or cartilage-splitting approach weakens or disrupts the support mechanism of the nasal tip. Reducing the cartilaginous dorsum and shortening the caudal septum significantly decreases nasal tip projection. Another study also demonstrates loss of nasal tip projection after conventional alar cartilage reduction techniques. Loss of tip projection usually is acceptable from the masking effect of the concurrent reduction in dorsal nasal height. Anticipate loss of projection in excisional reductive techniques of the lower lateral cartilages and take steps to regain this projection. The proportions and symmetry of the alar cartilages determine the amount of tip projection and definition that may be obtained by changing the length and strength of the tripod's legs and its supporting pedestal. The involvement of the medial crura in tip support is important, especially when the length extends to the columellar base. If the medial crura do not extend the full length of the columella, disrupting the attachment to the caudal septum with a complete and bilateral septal transfixion incision destroys much of the crucial support. While healing, the feet of the medial crura may settle to the level that becomes the new columella base, resulting in a loss of tip projection. To prevent extreme settling when detachment of the medial crura from the caudal septum is necessary, additional support can be provided by inserting propping grafts or cartilaginous struts or by suspending the medial crura from the caudal septum by placing permanent suspension sutures. As previously described, the medial crural leg is supported by its attachment to the inferior margin of the nasal septum and suspended superiorly by the Pitanguy ligament. Complete bilateral transfixion incision interrupts the Pitanguy ligament and lowers the dorsal septal angle, which results in loss of tip projection. Predictable consequences include a drooping tip and a more acute nasal labial angle because the medial leg of the tripod support is disrupted, allowing it to tilt in the direction of the shorter leg. If the lateral crura are shortened and a bilateral transfixion incision is extended inferiorly past the medial crura footplates, a reduction of tip projection results. Tip ptosis is minimized because a taller tripod has been converted on all 3 sides to one with shorter legs. The net effect is tip retrodisplacement. The skin and soft tissue covering are deprived of their support, causing nostril flaring, and alar sill resections may be required. A restricted or no-transfixion incision, along with shortening of the lateral crura, helps maintain much of the preoperative tip support but allows for cephalic rotation of the tip and produces a more obtuse nasal labial angle. When the medial crura are supported by a cartilaginous columella strut, propping grafts, or permanent septal columella suture, the medial leg of the tripod becomes the dominant leg, allowing the tip to rotate superiorly toward the forehead. Several techniques are available to the rhinoplastic surgeon to modify the tip. These techniques include suturing, scoring or crushing resection, and grafts to the tip. See the images below. Tripod reconstitution with septoplasty, columellar strut, spreader grafts, and tip sutures. In keeping with the tripod theory, many of the supporting structures to the tip are interrupted during rhinoplasty, thus increasing tip definition during surgery is necessary. In the lateral crural steal, which is performed through an open rhinoplasty approach, an increase in length of the medial crura is provided at the expense of the lateral crura. Inferior to superior horizontal mattress suturing first stabilizes the medial crura. A cartilaginous columella strut placed between weakened medial crura to provide support may be necessary. Once stabilization is complete, advance the lateral crura medially and suture each, first to the medial crus and then to its counterpart on the opposite side, with a mattress suture across the tip complex. This provides tip rotation and elevation. In the transdomal suture technique, perform systematic graduated nasal tip modification by preserving the integrity of the nasal tip with conservative reorientation of its structures. 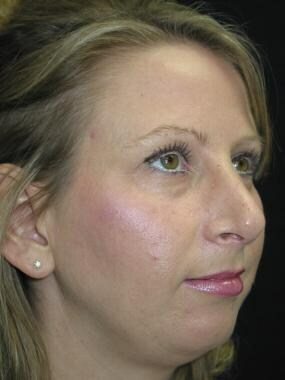 The transdomal suture most benefits patients with a broad trapezoid nasal tip. Typically, the alar cartilages are firm and strong with an arch in the domal segment that is broader than normal connecting the intermediate and lateral crura. The effects of sutures depend largely on the magnitude of suture tightening, the intrinsic forces on the cartilages, cartilage thickness, and the degree of soft-tissue undermining. The tip complex is perhaps the most intricate of the nasal structures, exhibiting subtle but evident responses to manipulations of the lower lateral cartilages. The medial crura suture approximates the medial crura and strengthens the support of the tip. The suture also has effects that are less immediately conspicuous. Slight narrowing of the columella, caudal protrusion of the lobule, and minimal caudal rotation of the lateral crura occur. The middle crura suture approximates the most anterior portion of the medial crura. This suture causes greater strengthening of the tip and some approximation of the domes. The interdomal suture approximates the domes and can equalize asymmetric domes. However, the entire tip may shift to the short side if a significant difference in the heights of the domes exists because of short lateral and medial crura. Transdomal sutures narrow the domal arch while pulling the lateral crura medially. The net results are increased tip projection, alar rim concavity, and the potential need for an alar rim graft. In addition, depending on suture position, cephalic or caudal rotation of the lateral crura may be observed. The lateral crura suture increases the concavity of the lateral crura, reduces the interdomal distance, and may retract the alar rims. Perhaps the most significant inadvertent results of this suture are caudal rotation of the tip and elongation of the nose. This is important because patients who undergo rhinoplasty would often benefit from cephalic, rather than caudal, rotation of the tip. The medial crura-septal suture not only increases tip projection but also rotates the tip cephalically and retracts the columella. The tip rotation suture shifts the tip cephalad while retracting the columella. The medial crura footplate suture approximates the footplates, narrows the columella base, and improves undesirable nostril shape. The lateral crura convexity control suture alters the degree of convexity of the lateral crura. The most effective, predictable, and least destructive means of narrowing the nasal tip uses interdomal or transdomal sutures. Interdomal sutures are indicated when the patient has a desirable arch form, yet the domes are divergent. Simple approximation of the domes adequately narrows the nasal tip in this group of patients. Use transdomal sutures to narrow the widely arched domes. Once the domes are narrowed, decide whether an interdomal suture also is necessary (this is often the situation). Reserve resection and reconstitution of the dome for those patients who have a significantly ultraprojected and wide tip. In this group of patients, narrowing the tip additionally augments the projection, which is already excessive. On rare occasions, removal of the extra fat between and overlying the domes is necessary to achieve the intended tip refinement. Transection of the domes increases the tip projection by redistributing the excessive horizontal cartilage in a vertical direction. However, transection of the domes seldom provides an ideal tip definition and often introduces irregularities, especially in thin-skinned noses. Modifications of the alar cartilages designed to increase the projection can involve weakening by scoring, crushing, or morselizing the portion of the lateral crura immediately lateral to the dome and the middle or intermediate crus immediately below the dome. Use a horizontal mattress suture to pull the tip-defining point centrally and to carry the alar cartilages medially, narrowing the lobule and increasing the vertical height of tip-defining points. These maneuvers are most applicable when the tip-lobule complex is broad and the excess width can be converted aesthetically into vertical projection. Resect the lateral crus lateral to the dome, with centralization of the dome and intermediate crus to narrow the lobule and add projection to the tip. The method borrows from the lateral crus to augment the height of the medial crus. In vertical dome division with an open rhinoplasty approach, cartilage can be resected with suture reapproximation, or cartilage can be overlapped and sutured after dome division. Vertical dome division is recommended to correct lobule asymmetry, retrodisplacement, wide domal arch, and a hanging infratip lobule. The authors note that an important consideration in the cartilage-overlap technique is a reduction in nasal tip projection. If a loss of tip projection is not desired, tip grafts or other methods to enhance tip projection are needed. 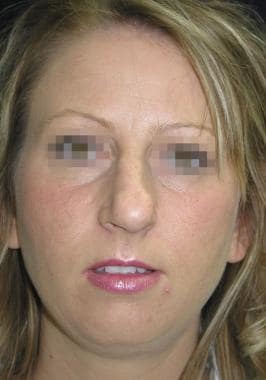 Prior to contouring the nasal tip, the surgeon must stabilize the base of the nose with a columellar strut, suturing the medial crura to a long caudal septum, caudal extension graft, or an extended columellar strut graft. Stabilizing the nasal base will ensure that tip projection is maintained postoperatively. Analysis by Rohrich et al showed that when a columella strut was used in primary rhinoplasty, the nasal tip projection actually decreased more often than it increased. This is in contradiction to the common assumption that a columella strut automatically increases tip projection. They postulate that a columella strut helps control and/or maintain tip position. Grafts to the lobule complex can improve tip projection when manipulation of the existing cartilage fails. All the techniques involve placement of a cartilage graft within a limited soft-tissue pocket under some degree of tension to produce angulation at the columella lobule junction, projection and angularity at the dome area, and support of the medial crura columella to prevent settling. A strut of cartilage from the septum placed between the medial crura, from the level of the upper border of the nostrils downward almost to the premaxilla, can be used. A lateral crural strut graft is a versatile technique for reshaping, repositioning, or reconstructing the lateral crura. After cephalic trim of the lateral crus through the open approach, create a pocket under the lateral crura and place a carved 3- to-4 mm wide and 15- to-25 mm long cartilage strut on the deep surface of the lateral crus in the previously created pocket. Secure it with 5-0 Vicryl suture. This technique can be used to correct boxy tips, a malpositioned lateral crus, alar rim collapse or retraction, and concave lateral crura. Alar rim grafts can be used to support the alar margin and create a defined ridge that extends from the tip lobule to the alar lobule. This form of restructuring can create a natural-appearing nasal tip contour with a horizontal tip orientation continuing out to the alar lobule. Anatomic cartilage grafts similar in shape, bulk, and position to normal alar cartilages can be designed from septal, ear, and rib cartilage, fixed to the residual medial crura or a columellar strut (or both), and bent backward to restore the normal skeletal framework of the tip. During an open rhinoplasty, a fabricated and rigid framework is fashioned to replace the missing medial, middle, or lateral crus of one or both alar cartilages. The entire alar tripod is recreated. These anatomic alar cartilage reconstructive grafts create tip definition and projection; fill the lobule and restore the expected lateral convexity; position the columella and establish columellar length; secure and position the alar rim; and brace the external valve against collapse, support the vestibular lining, and restore a nostril shape. The anatomic form and function of the nasal tip is restored. This technique is recommended when alar cartilages are significantly destroyed or absent in secondary or reconstructive rhinoplasty and the alar remnants are insufficient for repair. Anatomically-designed alar cartilage replacements allow an aesthetically structured skeleton to contour the overlying skin envelope. Problems with displacement are minimized by graft fixation. Graft visibility is used to the surgeon's advantage. A rigidly supported framework with a nasal shape can mold a covering forehead flap or the scarred tip skin of a secondary rhinoplasty and create a result that may approach normal. 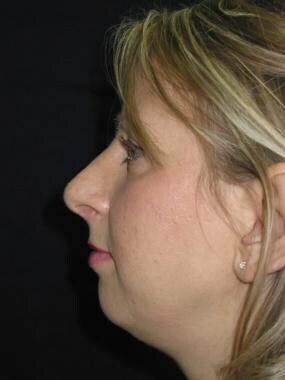 The comprehensive effects of surgical manipulation on the nasal tip are not visible for many years after rhinoplasty. A well-designed, conservative, and methodical surgical approach that maintains the normal anatomy of the nose as much as possible is paramount. Anderson JR. The dynamics of rhinoplasty. Presented at: Proceedings of the 9th International Congress of Otorhinolaryngology. Excerpta Medica. 1969. Rohrich RJ, Hoxworth RE, Thornton JF, Pessa JE. The pyriform ligament. Plast Reconstr Surg. Jan 2008. 121(1):277-81. [Medline]. Sirinoglu H. The Effect of the Short and Floating Columellar Strut Graft and Septocolumellar Suture on Nasal Tip Projection and Rotation in Primary Open Approach Rhinoplasty. Aesthetic Plast Surg. 2017 Feb. 41 (1):146-52. [Medline]. Toriumi DM, Checcone MA. New concepts in nasal tip contouring. Facial Plast Surg Clin North Am. 2009 Feb. 17(1):55-90, vi. [Medline]. Malone CH, Hays JP, Tausend WE, Wagner RF Jr. Interdomal sutures for nasal tip refinement and reduced wound size. J Am Acad Dermatol. 2017 Oct. 77 (4):e107-8. [Medline]. Adamson PA, McGraw-Wall BL, Morrow TA. Vertical dome division in open rhinoplasty. An update on indications, techniques, and results. Arch Otolaryngol Head Neck Surg. 1994 Apr. 120(4):373-80. [Medline]. Seneldir S, Altundag A, Dizdar D. Cutting the Holy Dome: The Evolution of Vertical Alar Resection. Aesthetic Plast Surg. 2018 Feb. 42 (1):275-87. [Medline]. Rohrich RJ, Kurkjian TJ, Hoxworth RE, Stephan PJ, Mojallal A. The effect of the columellar strut graft on nasal tip position in primary rhinoplasty. Plast Reconstr Surg. 2012 Oct. 130(4):926-32. [Medline]. Ho TT, Cochran T, Sykes KJ, Humphrey CD, Kriet JD. Costal and Auricular Cartilage Grafts for Nasal Reconstruction: An Anatomic Analysis. Ann Otol Rhinol Laryngol. 2017 Oct. 126 (10):706-11. [Medline]. 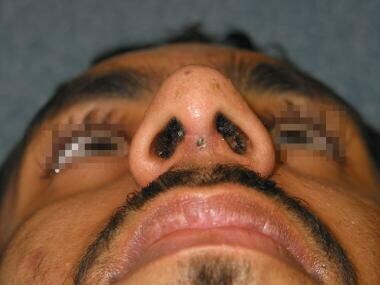 Anderson JR. New approach to rhinoplasty. A five-year reappraisal. Arch Otolaryngol. 1971 Mar. 93(3):284-91. [Medline]. Byrd HS. Rhinoplasty. Selected Readings in Plastic Surgery. 1997. Vol 8: 17. Daniel RK. The nasal tip: anatomy and aesthetics. Plast Reconstr Surg. 1992 Feb. 89(2):216-24. [Medline]. Daniel RK, Letourneau A. Rhinoplasty: nasal anatomy. Ann Plast Surg. 1988 Jan. 20(1):5-13. [Medline]. Goldman IB. The importance of the mesial crura in nasal tip reconstruction. Arch Otolaryngol. 1957. 65:143. Guyuron B, Behmand RA. Nasal tip sutures part II: the interplays. Plast Reconstr Surg. 2003. 112(4):1130-45. [Medline]. Han SK, Ko HW, Lee DY. The effect of releasing tip-supporting structures in short-nose correction. Ann Plast Surg. 2005 Apr;54(4):375-8. 2005. 54:375-378. [Medline]. Janeke JB, Wright WK. Studies on the support of the nasal tip. Arch Otolaryngol. 1971 May. 93(5):458-64. [Medline]. Kridel RW, Konior RJ, Shumrick KA. Advances in nasal tip surgery. The lateral crural steal. Arch Otolaryngol Head Neck Surg. 1989 Oct. 115(10):1206-12. [Medline]. Lessard ML, Daniel RK. Surgical anatomy of septorhinoplasty. Arch Otolaryngol. 1985 Jan. 111(1):25-9. [Medline]. McCollough EG. Surgery of the nasal tip: Prudent selection of alternatives. Daniel RK. Aesthetic Plastic Surgery Rhinoplasty. Little Brown & Co; 1993. 416. McCollough EG, English JL. A new twist in nasal tip surgery. An alternative to the Goldman tip for the wide or bulbous lobule. Arch Otolaryngol. 1985 Aug. 111(8):524-9. [Medline]. McCollough EG, Mangat D. Systematic approach to correction of the nasal tip in rhinoplasty. Arch Otolaryngol. 1981 Jan. 107(1):12-6. [Medline]. Menick FJ. Anatomic reconstruction of the nasal tip cartilages in secondary and reconstructive rhinoplasty. Plast Reconstr Surg. 1999. 104(7):2187-98. [Medline]. Petroff MA, McCollough EG, Hom D. Nasal tip projection. 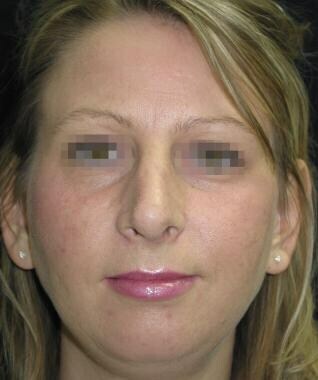 Quantitative changes following rhinoplasty. Arch Otolaryngol Head Neck Surg. 1991 Jul. 117(7):783-8. [Medline]. Pitanguy I, Salgado F, Radwanski HN. The surgical importance of the dermocartilaginous ligament of the nose. Plast Reconstr Surg. 1995 Apr. 95(5):790-4. [Medline]. Rich JS, Friedman WH, Pearlman SJ. The effects of lower lateral cartilage excision on nasal tip projection. Arch Otolaryngol Head Neck Surg. 1991 Jan. 117(1):56-9. [Medline]. Sheen JH. Achieving more nasal tip projection by the use of a small autogenous vomer or septal cartilage graft. A preliminary report. Plast Reconstr Surg. 1975 Jul. 56(1):35-40. [Medline]. Sheen JH. Middle crus: The missing link in alar cartilage anatomy. Perspectives Plast Surg. 1991. 5:31. Tardy ME Jr, Patt BS, Walter MA. Transdomal suture refinement of the nasal tip: long-term outcomes. Facial Plast Surg. 1993 Oct. 9(4):275-84. [Medline]. Tebbetts JB. Shaping and positioning the nasal tip without structural disruption: a new, systematic approach. Plast Reconstr Surg. 1994 Jul. 94(1):61-77. [Medline]. Upper lateral cartilages with spreader grafts. Columella strut and spreader grafts.